At the beginning there was an ant. The ant crawled onto the wall of an abandoned, half-damaged kiosk in the Cairo neighbourhood of Dokki; it started examining the passers-by as they rushed to their destinations. Everyone seemed busy – men, women and children – as they moved in a predefined direction, at a precise pace. The ant understood that in this socially organised whole, everyone had a role to fulfill, everyone knew how to channel their energy as they were reduced to functions and numbers, carrying the illusion of an identity that they would gradually be stripped of. The people who thus turned into a colony continued to move swiftly before the ant, reminding it of its own species: workers, soldiers and queens. As the ant watched the growing formicary and pondered the destiny of each passer-by emerging from it, autumn winds started speaking of social mobilisation. Then came the January 2011 Revolution. While the colony called for the fall of the regime in millions, the ant started multiplying. The voices in the city amplified, and more ants spread to more walls, bringing with them the word “Keizer” – an alternative signature of the prime-ant creator. In the heat of the revolution, the Egyptian graffiti artist came to the limelight with his stencil of an ant, but in the following months and years, his works developed to cover a wide range of visual ideas, signed either Keizer or with the ant. Keizer is recognised for many other works, among them the word “Capitalism” written in the Coca Cola font, a Snow White holding a Kalashnikov, women demanding their rights, activist Alaa Abdel-Fattah saying “Don’t forget me,” Umm Kalthoum reminding us that art is not a sin, the ultimatum “Respect Existence or Expect Resistance,” a large representation of Leon Trotsky, a picture titled “Drugged” showing a capsule with Facebook’s logo, or the phrase “You Are Beautiful,” which has touched passers-by. 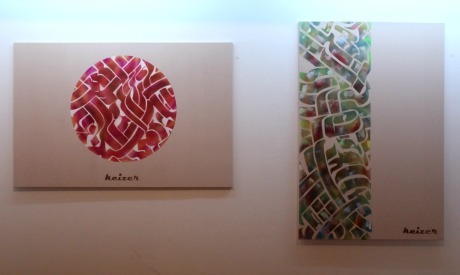 Keizer also creates work inspired by calligraphy, geometrical shapes, and explores urban manipulations. And though, at the peak of graffiti, many other artists – Ganzeer, Sad Panda, El Teneen, Nazeer, Zeft, Ammar Abu Bakr etc – took their creativity, social and political commentaries and frustrations and occasional dosage of hope, to the streets, Keizer remains active in Egypt, six years later. Keizer’s large body of work includes thematic content that ranges from political and social issues to abstract forms, expressed visually, in text or through a mixture of both. His creative impulses can go as far as infusing graffiti with calligraphy and geometry; some of his works incorporate minimalist thinking, others use the language of dada to reject standards or to form poignant contradictions; others still fuse heritage with modernity. Rather than making political statements, the exhibition took a lighter note and showcased the artist’s conceptual versatility and creative development. This procedure allows Keizer to escape from being strictly classified as a political artist, without jeopardising his individuality or challenging the presence of his creative voice and its history in Egypt’s still very young graffiti movement. 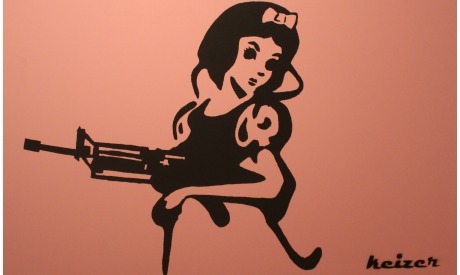 Keizer’s iconic “Donkey Departure” greets us at the entrance to the gallery, before we move towards a set of poignant contradictions: the seemingly innocent Snow White stencil, on a sweet pink background, holding a weapon; guitars falling from a military plane in a piece entitled Musical Warfare. On the other hand, the scream of painful satire can be heard in a work that depicts a group of people worshipping Nutella. The exhibition also presented a number of calligraphic works which, though hardly new to viewers, always redirect the eye to the beauty of Arab heritage. Keizer does not reveal much of his background; we won’t hear him talk about his family, educational background or jobs prior to becoming a graffiti artist. We can, however, understand him better by navigating the map of works of literature and art that have touched his soul, and looking at the travels that have enriched him on the personal level, ranging from a few months to a couple of years in Peru, Australia and South East Asia as well as Europe and the US. Keizer reveals that his teenage years were strongly inspired by Salvador Dali and Picasso. Then he began to discover less commercial artists. His interest in political propaganda and its materialisation in the art of posters, including those coming from the CCCP (Central Committee of the Communist Party of the Soviet Union), comes as no surprise. 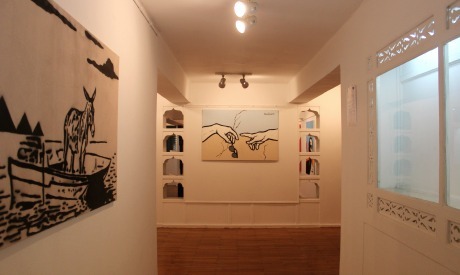 With many examples, art genres and conceptual transformations, Keizer’s list of influences is long, expanding also to the American songwriter and artist, Bob Dylan. 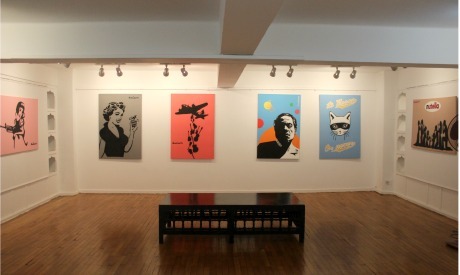 He underlines, however, that he also cherishes traditional art and vintage material. 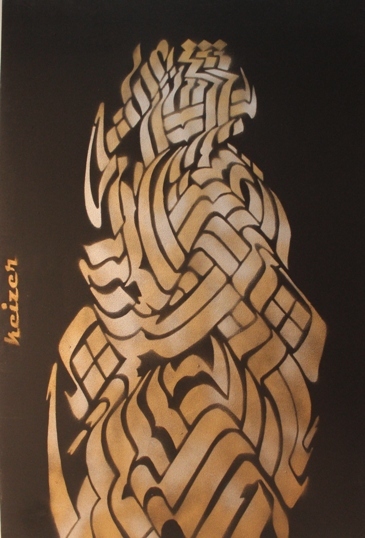 It is in this context that we can see Keizer’s experimentation with calligraphy and symmetry, which though it looks like Arabic script, does not consist of recognisable letters or words. This calligraphy is probably the best testimony to Keizer’s ability – and need – to embrace both past and present, heritage and modernity. “I think I have been influenced by everything I see and experience, from visual art to audio and to everything that comes into play with the world of art,” he comments. As he continues to venture, his vast body of work helps him escape from being pigeon-holed or classified. “I do not want to be dubbed a political artist. This would mean death for my career as an artist as I would be obliged to keep going politically regardless of the reality.” Keizer adds that there are many more factors that have contributed to his development, allowing him to appreciate beauty and other aesthetics besides. However, beyond his belief in the right to privacy – a value abandoned by artists trapped in the commercial dynamic – and the need to ensure his own personal security, Keizer has been planning to live off the grid for some time already. With the rapid growth of the consumerist lifestyle, Keizer’s ideology might sound utopian to many. However, further exploration of his mind will reveal that at the heart of his thought lies a belief in harmony as expressed through a collective community whose members take care of each other, sharing together and that cooperates together. But despite the downslide of many such aspects of life, Keizer still believes in harmony and humanity, values which directly feed his art. My optimism has to do with my idealism rather than the Egyptian situation per se. I’ll always be defending universal issues of oppression and injustice –issues that have to do with Egypt,but at the world at large as well, whether its societal, political, satire or women’s rights. I’m in touch with a lot of political movements, young people; I can feel the pulse of the street. I was more optimistic before, thinking there was a chance for another uprising. Maybe I was one of the last people to wake up and accept the current reality,” he comments, pointing to several other factors that trigger his thoughts and artistic rhythm. The first ant – his optimal symbol of frustration against the loss of individuality and therefore the loss of humanity – appeared hardly two months prior to the revolution and though back then he had been experimenting, he seems to have found himself at the right moment in Egypt’s socio-political history. Though the revolution generated a great boost in terms of exposure to graffiti, music, photography and other arts, the perspective of time has shown that those who utilised the hype and the media to their benefit burned out very quickly. As a result, today most Egyptian graffiti artists of 2011-2013 have either left the country or remain dormant. Keizer says that though the general interest of the international community in the graffiti artists’ work at that time did undeniably bring much needed attention to his experiments, he never felt comfortable with the kind of showmanship to which many of his peers eventually succumbed. Though Keizer feels lucky that at one point the revolution boosted his art, he chose to continue even when international eyes turned away from the country. He recalls this experience as one of the big surprises to his audience with some viewers complementing the idea and others expressing disappointment. “I never give the audience what they want,” he comments. Protecting his identity and creativity, Keizer does not leave viewers without the right to respond. In fact, being a big believer in graffiti as the most democratic art form, Keizer is always happy when his work triggers a response, even – maybe especially – when this response comes as the whitewashing of the wall. In fact it is through whitewashing that he can see how big an impact his work created. And while in a sense he loses his piece, Keizer believes that the graffiti artist should not have any attachment to work that is already out there, as this is when it no longer belongs to him. He is never without pleasure; he enumerates numerous instances of catharsis that he experiences while creating his art. “It is therapeutic when I draw a pattern, then apply it. Then there is the great pleasure that comes with its release to the world, when I take the stencil off the wall and see the final work. There is also the pleasure of getting away with it,” he laughs. With the end of Mashrabia exhibition, Keizer will go back to the streets. Though we will never know when and where his work will appear, he does assure us that in the next few weeks he will be exploring more urban manipulations.